This exhibition is a celebration of the estuary of the River Stour which forms, for most of its length, the border between Essex and Suffolk. The show is part of the River Stour Festival which is celebrating the whole length of the river, its culture, communities and surrounding landscape throughout 2018. North House Gallery overlooks the estuary which is crucial to the light and atmosphere of the spaces inside, almost as important as the views, which change constantly with the time, tide and weather. Most of the 18 artists have shown at the gallery before and all know the estuary well. 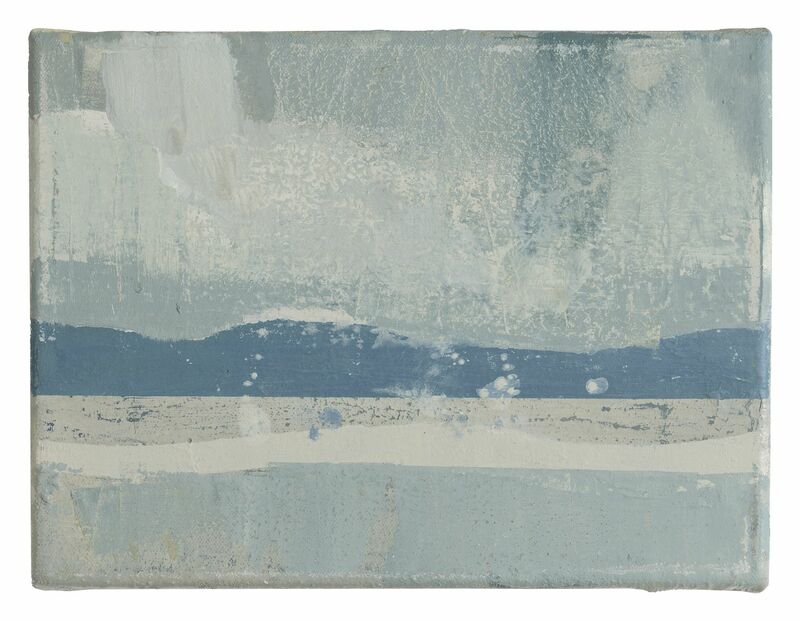 Two dimensional work comes from Norman Ackroyd RA, Michael Checketts, Daisy Cook, Neil Davey, Martin Fidler, Jason Hicklin RE, Melvyn King, Kit Leese, Ffiona Lewis, Jane Lewis, Ali Morgan, Andrea Newman, Ruth Philo, Dina Southwell, Rachel Spender and Francis Tinsley. Jasper Startup and Michael Tingle have submitted sculpture. Part of the interest of the show is in the huge variety of perception and treatment of the subject. 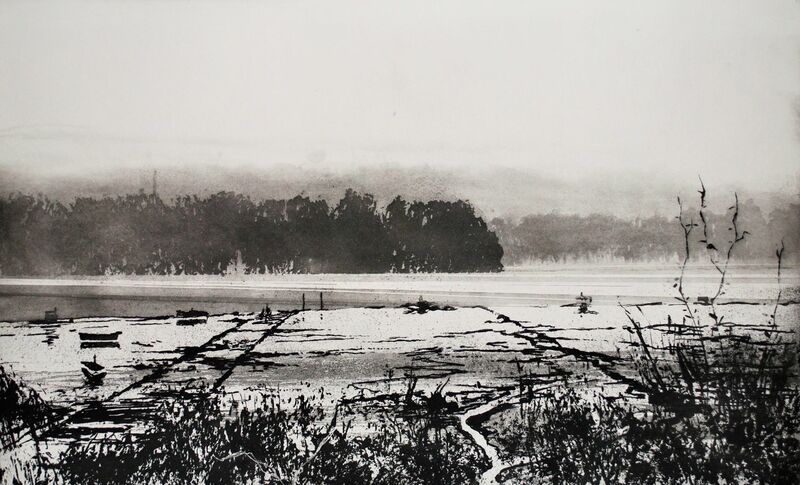 Norman Ackroyd usually visits at Christmas so his etchings catch the wintry light. Michael Checketts can be seen painting along The Walls in all weathers and times of day. 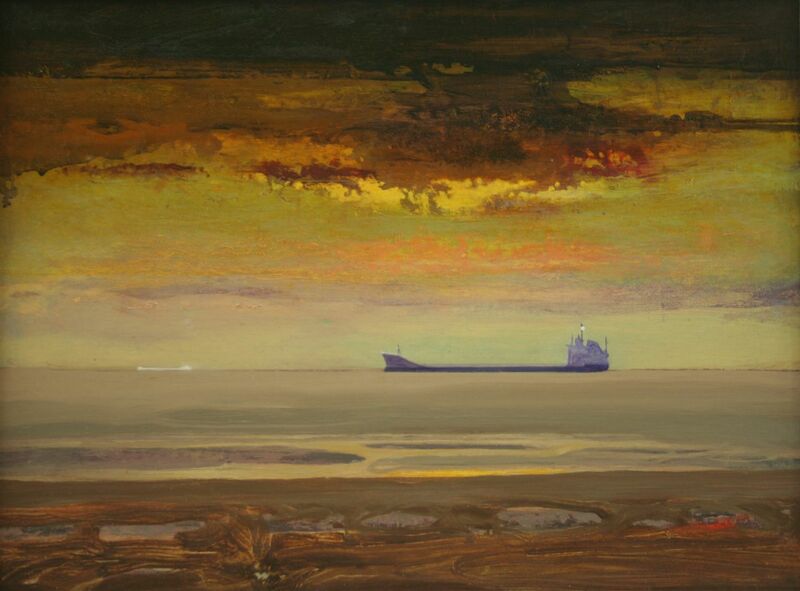 There are also paintings from Wrabness and Harwich. Daisy Cook is fascinated by the interplay of light, land, water and sky: her paintings in oil on canvas have something of the sublime about them. Neil Davey’s small canvases capture the hazy May light looking down from the top of the estuary at Cattawade. Further downriver from Wrabness, Martin Fidler’s conceptual series of four paintings in acrylic on paper is called TIDE, the acronym relating to the call sign of the river police (Tango, India, Delta, Echo). Jason Hicklin has been working on several estuaries lately in the North and in Australia. While his large diptych etching is specific to the Stour, his work always tries to find a more universal essence of a landform. 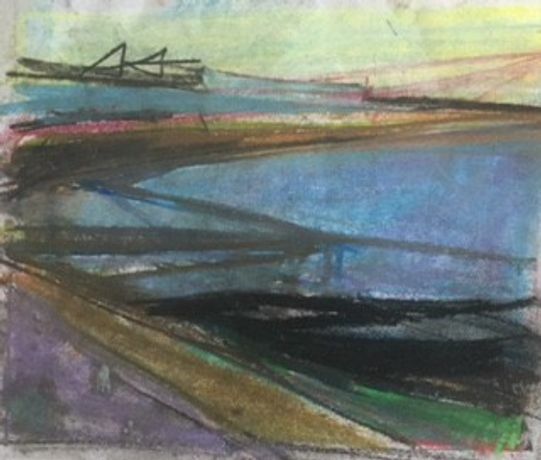 Mel King’s series of paintings in oil or acrylic on paper focus on the east end of the river where ‘The Estuary Meets the Sea’. Kit Leese is another artist that goes out in all weathers: his gentle works on paper include a spectacular river snow scene. Ffiona Lewis is interested in the spaces between the structures in her painting: here the river is seen through spruces. Jane Lewis takes the landscape as the starting point for her abstract paintings which are studies of colour and texture. Ali Morgan, fresh from her recent exhibition of immaculate tree drawings at NHG has contributed two drawings of boats at low tide at Mistley. Andrea Newman also draws at Mistley: studies in pastel of the swans, including the pair of non-native black swans. 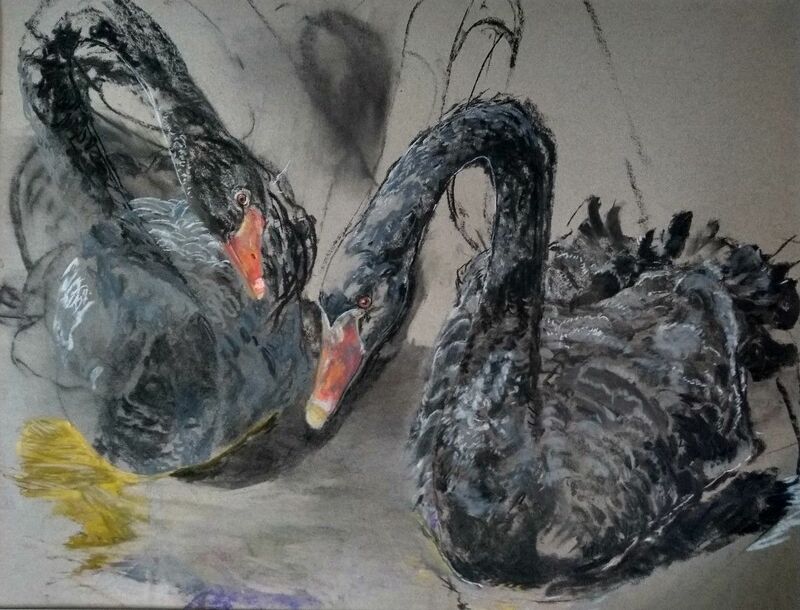 Ruth Philo is the brains behind the whole River Stour Festival: as well as her abstract paintings, her film The River Runs Through Us will be shown at the gallery. Dina Southwell will be contributing drawings, paintings and collages of the estuary in her exuberant, colourful style. Rachel Spender’s huge aerial photographs of mud channels are hand printed by her in black and white, while Francis Tinsley’s paintings of boats and tankers at the mouth of the river capture the most incredible colour of the reflected light. Jasper Startup has made sculptures from assembled debris found on the foreshore while Michael Tingle’s sculptures of printed wood are witty little surprises. Ken Rickwood, author of Stour Secrets and Stour Odyssey, who has travelled the length of the river by small boat from Harwich to Kedington and beyond, will be at the opening on 30 June, 2–4pm to chat about the river, the estuary and sign books. Black Sandal Poetry Reading with music by the Columbines (not to be missed) at North House Gallery on 14 July, 7.30pm, £5. Film: The River Runs Through Us, will be run at North House Gallery on 21 July, 8pm (weekend of the Manningtree Beer Festival), Free.